Living systems can switch between different reaction pathways to convert sugar substrate to energy or building blocks, depending on the current need. Such ability to easily switch reaction pathways would also be desirable for technical processes, so that society can tackle its demand for energy and materials. We have identified conditions, where a catalytic system can selectively produce one out of four valuable chemicals from a substrate deriving from hemicellulose sugar. Current human consumption of natural resources on planet earth is not sustainable. This overconsumption places an increasing strain on the stability of human societies, of the environment and of the climate alike. There is a growing urgency for changing our attitude towards energy and material production, and for devising new processes that use rapidly renewable resources in a material and energy effective manner. Such processes are commonly made possible through the discovery and use of catalysts. 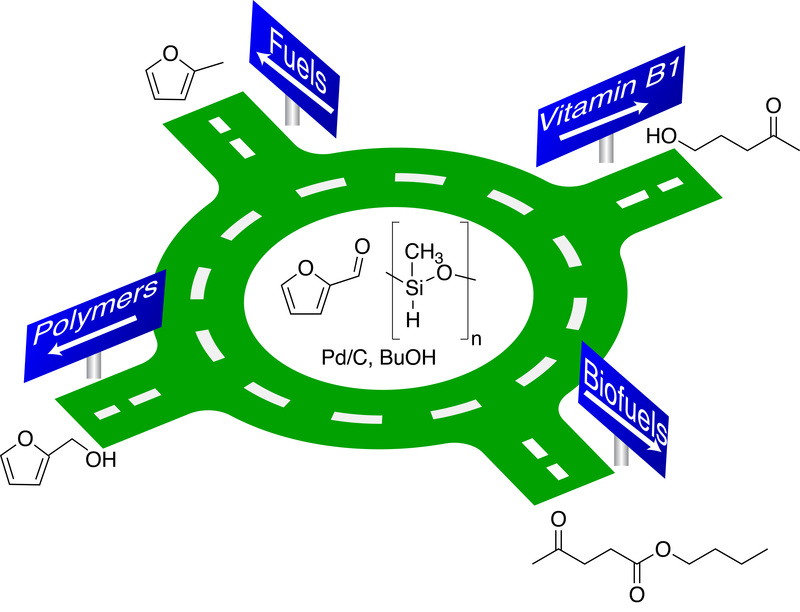 Catalysts open alternative pathways for molecular transformations by reducing the energy requirement in this pathway. Different catalysts thus enable different pathways. This mode of action saves energy and improves the specific formation of materials, pharmaceuticals and fuels sustaining our way of life. Rapidly renewable molecules commonly contain more oxygen than chemicals from fossil resources. Therefore, a critical step in the transformation of rapidly renewable molecules to key chemicals is the reduction by hydrogen. In our study, an international (intercontinental) research team from China, India and Denmark set out to find convenient and safe ways to produce multiple bio-based chemicals using an existing catalyst in a low-energy processes (only 15-100 ºC of reaction temperature). Living systems are sophisticated enough to switch between different pathways for the molecular transformations of central chemicals, depending on their current demand for energy or building blocks. We pursued a similar approach of controllable catalysis. The substrate for our process was furfural, a simple molecule with a current annual production above 300 million kilograms. Furfural can be directly derived from sugar. For several years now, furfural has been recognized as a promising substrate for fuels and building blocks. We found that a commercial catalyst of palladium on carbon could switch between catalyzing the formation of four different products from furfural. We achieved this controllable switching by variation of the dosage of a liquid, easy-to-handle hydrogen donor, and by simple adjustments of the reaction conditions. Soaking the catalyst in water, use of acidic additives and tuning of the process temperature gave easy access to four different transformations. The products include a pharmaceutical intermediate, a molecule used to improve biodiesel, a molecule that can be used as engine fuel and a monomer for bio-based coatings, adhesives and cements. Mechanistic insights into the pathways leading to these products were obtained from NMR spectroscopic methods, resembling methods more widely used in the study of biochemical pathways. Overall, we believe that our study describes an innovative and convenient way to control catalytic transformation of rapidly renewable molecules to various, valuable chemicals.